Numerous PowerShell add-on modules provide security and attack functions for penetration tests and forensic analyses, to help admins search for vulnerabilities in their networks. Penetration tests try to find and legally exploit weaknesses in a system's security, so admins can manage their computer systems more securely. Security problems can be identified by using an automated tool, a manual method, or a combination of the two. In this environment, PowerShell can deliver excellent results with its modules for penetration testing and exploits. Some PowerShell extensions expand the command set or provide more secure alternatives for standard procedures, such as SSH as an alternative to Windows Remote Management (WinRM) remote maintenance. Even malware scanners are implemented as PowerShell components. Code execution: Execution of low-level code and code injection. Script modification: Modifying or preparing scripts for execution on a compromised machine. Reverse engineering with appropriate tools. Filtering: Access to sensitive data from a compromised machine. Recon: Support in the reconnaissance phase of a penetration test. 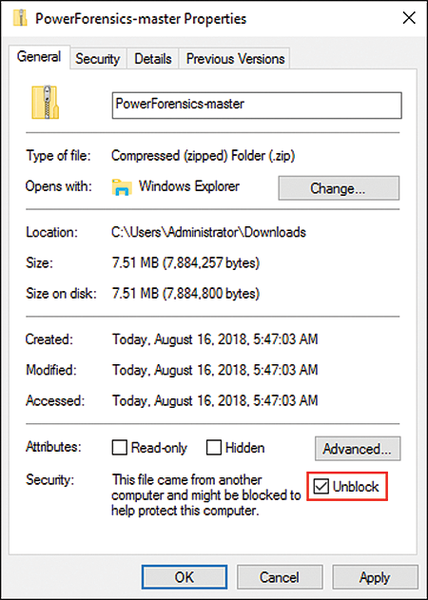 Local installation with install modules might activate your virus scanner, so you should unblock any ZIP files you download from the GitHub repository; otherwise loading additional modules fails (Figure 1). Figure 1: To download further modules, the download block must be deactivated for ZIP files. By combining applications like AppLocker, rigid access restrictions, and PowerSploit cmdlets, you can find an optimal configuration that makes it possible to strike a balance between functionality and security. The field of application is therefore primarily simulated attacks on remote computers. This command string correctly prepares the -Shellcode parameter value. When passed to -Shellcode without specifying a process ID, the Invoke-Shellcode cmdlet starts the machine in the process space of the current PowerShell. Network shares that are not inventoried, whose permissions structure is obsolete and point to users who are no longer active in the company, are a security problem. Documenting the existing shares is a necessary first step toward cleaning up the existing structure and a conceptual new beginning. The Invoke ShareFinder function from PowerSploit is very helpful for this objective. It uses the Get-NetDomain cmdlet to find the local domain name for a host and asks the domain for all active hosts (with the Get-NetComputer cmdlet). Each server lists active shares when queried by the Get-NetShare cmdlet. PowerSploit's Invoke-Mimikatz exploit function lets you extract plain text credentials from memory, password hashes from local SAM/NTDS.dit databases, advanced Kerberos features, and more. The Mimikatz codebase in PowerSploit is slightly modified compared with the original; it runs only in memory and leaves no traces on the hard drive. Windows is no longer the system for mouse pushers. In the latest server version, the default installation installs without a GUI, and management via PowerShell is a part of everyday life for Windows administrators. Microsoft has broken new ground with the release of PowerShell Core 6.0, which at heart is a complete reboot in terms of architecture and objectives. For the first time, a new version is not linked to the Windows operating system. Windows 10 brings an updated, fifth release of PowerShell that vastly simplifies the task of managing modules and software packages. The scripting language now also handles various formatted output from commands and selection lists. Windows administrators, like Unix or Linux administrators, look for ways to perform their duties with ease and elegance through automation. PowerShell allows administrators to gather information, change Registry parameters, work with Active Directory, manipulate services, look at events, work with Windows Management Instrumentation (WMI), and much more. PowerShell is a Windows administrator’s best friend.